After a slight rise in May, the International Coffee Organization (ICO) reports that prices for all group indicators fell for the second consecutive month in July 2018. Coffee prices have fallen consistently over the course of coffee year 2017-18, with decreases recorded in seven out of the last ten months. Total exports in June 2018 amounted to 10.45 million bags, 2.6% higher than in the same month one year ago, led by an increase of 7.9%, to 3.95 million bags for Robusta. However, total Arabica shipments in June 2018 fell by 0.4%, to 6.51 million bags, with exports of Colombian Milds growing by 1.1%, to 1.03 million bags, and Brazilian Naturals by 2.2%, to 2.61 million bags. Other Milds fell by 3.2%, to 2.87 million bags. Coffee prices have fallen consistently over the course of coffee year 2017-18, with decreases recorded in seven out of the last ten months. The monthly average of the ICO composite indicator fell by 2.9%, to 107.20 US cents/lb in July 2018. This represents the lowest monthly average for July since 2007. The daily composite indicator moved within a range of 104.98 US cents/lb and 109.46 US cents/lb. The fall to 104.98 US cents/lb on 18 July was the first decline below 105 cents since 2 January 2014. Even with growing demand, ample supplies in 2017-18 and good prospects for a larger crop in coffee year 2018-19 are weighing heavily on coffee prices. Prices for all coffee groups fell in July 2018, though the largest month-on-month decrease occurred for Brazilian Naturals. The average price for Brazilian Naturals fell by 4%, to 110.54 US cents/lb, followed by a decline of 3.3%, to 133.92 US cents/lb, for Colombian Milds. Other Milds decreased by 2.6%, to 130.60 US cents/lb, which narrowed the differential between Colombian Milds and Other Milds by 26.5%, to 3.32 US cents/lb. 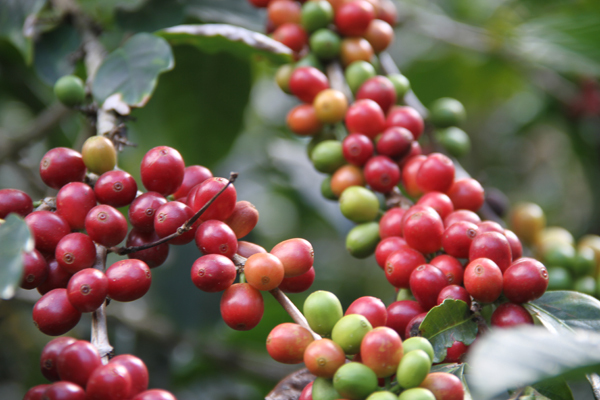 The monthly average Robusta price fell by 1.9%, to 84.42 US cents/lb. The average arbitrage in June, as measured on the New York and London futures markets, fell by 10%, to 38.50 US cents/lb. However, intra-day volatility of the ICO composite indicator price increased by 0.3 percentage points to 4.8% as intra-day volatility for all Arabica indicators increased while the volatility of Robusta fell by 1.4 percentage points to 4.1%. Total exports in June 2018 amounted to 10.45 million bags, 2.6% higher than in the same month one year ago. Robusta exports saw an increase of 7.9%, to 3.95 million bags, while Arabica shipments fell by 0.4%, to 6.51 million bags. Exports of Colombian Milds grew by 1.1%, to 1.03 million bags, and Brazilian Naturals grew by 2.2%, to 2.61 million bags. However, shipments of Other Milds amounted to 2.87 million bags, 3.2% lower than in June 2017. Total coffee exports for October 2017 through June 2018 were 0.3% higher than those in the same period one year ago. This growth was led by increased shipments of Robusta, which reached 33.8 million bags, 3.6% higher than one year ago. In contrast, Arabica shipments declined by 1.5% to 57.06 million bags in the first nine months of coffee year 2017-18. Exports of Colombian Milds and Brazilian Naturals decreased by 6.1% to 10.48 million bags and 3.1% to 25.67 million bags, respectively. However, shipments of Other Milds are 3.1% higher at 20.91 million bags compared to one year ago. World production in 2017-18 is estimated at 158.56 million bags, 0.3% lower than last year. Arabica output is estimated 6.6% lower, at 97.16 million bags, while Robusta production is estimated at 61.4 million bags, 11.5% higher than 2016-17. Production is estimated to have grown in all regions except South America, which is 8.2% lower at 70.57 million bags. Brazil is both the world’s and region’s largest producer of coffee and its output in 2017-18 is estimated at 51 million bags, 10.2% lower than 2016-17. However, its 2018-19 crop, harvesting of which is more than 70% complete, is expected to increase due to beneficial weather, recovery in Robusta production and Arabica being in an on-year in the biennial cycle. Output from Colombia, the region’s second largest producer and world’s third, is estimated at 14 million bags, 4.3% lower than in 2016-17. Exports from Brazil in the first nine months of 2017-18 reached 23.47 million bags, 5.7% lower than in the same period one year ago, due to a smaller crop and to a truck drivers’ strike in May 2018. However, Brazil’s exports in June 2018 grew to 2.55 million bags, 48% higher than in the previous month and 16.5% higher than June 2017. Colombia’s shipments fell by 3% to 0.92 million bags in June 2018, following two months of increased shipments compared to one year ago. Its total exports for October 2017 to June 2018 reached 9.49 million bags, 6.7% lower than in the same period one year ago. Africa’s output in 2017-18 is estimated 5.3% higher at 17.63 million bags with production anticipated to increase in the region’s two largest producers, Ethiopia and Uganda. Ethiopia’s coffee output has grown steadily in the last five crop years, and is estimated at 7.65 million bags in 2017-18, up 4.8% on 2016-17. After declining by 2.5% in 2015-16, Uganda’s production expanded in 2016-17 and is estimated 2.8% higher at 5.1 million bags in 2017-18. Compared to June 2017, shipments from both Ethiopia and Uganda declined in June 2018 by 14.8%, to 0.4 million bags and 25.6% to 0.32 million bags, respectively. Exports for October 2017 through June 2018 increased by 7.4%, to 2.66 million bags, for Ethiopia, but decreased by 2.7%, to 3.32 million bags, for Uganda compared to the same period one year ago. Production in Asia & Oceania is estimated to increase 7.9%, to 48.44 million bags, which is 2.2% lower than the record production reached in coffee year 2015-16. Vietnam is the region’s largest producer, harvesting more than double the volume of Indonesia, the second largest grower in the region. In 2017-18, Vietnam’s production is estimated at 29.5 million bags, 15.5% higher than last year. However, Indonesia’s crop is estimated 5.1%, lower, at 10.9 million bags, due to poor crop maintenance and some farmers switching to other crops. Given the growth in supply, Vietnam’s exports are estimated at 2.58 million bags in June 2018, as against 1.92 million bags in June 2017, and by 19.4%, to 21.98 million bags, in the first nine months of 2017-18. In contrast, Indonesia’s exports are down 32.6%, to 4.14 million bags, for the period October 2017 through June 2018. In addition to lower production, Indonesia’s domestic consumption has also grown in the last few years, which reduces the supply available for export. Mexico and Central America’s production is estimated at 21.92 million bags, 7% higher than in 2016-17 with growth in all but one of the region’s five largest producers. Honduras’ output has grown at an average annual rate of 16.4% since 2013-14, reaching an estimated 8.35 million bags in 2017-18. Production in Mexico is estimated to increase 5.8%, to 4 million bags, and Guatemala is estimated to grow 3.1%, to 3.8 million bags. After declining in the five previous crop years, output from Costa Rica is estimated 13.7% higher, at 1.56 million bags in 2017-18. Although production in Nicaragua is estimated down 2.9%, to 2.5 million bags in 2017-18, this would be the second highest volume of production on record. Shipments from Honduras decreased by 6.9% to 856,001 bags in June 2018, and its shipments for October 2017 to June 2018 fell by 1.7% to 5.76 million bags despite the larger crop.